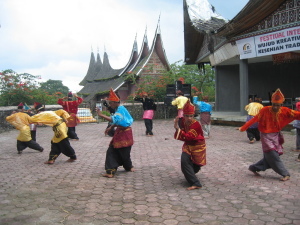 Randai in Minangkabau history has a long history. Perhaps it is reported he had played by the people of Padang Panjang Pariangan when society was successfully capture the deer out of the sea. Randai in Minangkabau society is an art that is played by several people or groups in the sense group, where randai in this story that there were, as the story Cindua Mato, Malin Deman, Anggun Nan Tongga, and other folklore. Randai aims to reassure the public is usually held at the party or the people on holiday Idul Fitri. Randai is played by the main duty will be the story, the main amount of this can be one person, two, three or more depending on the stories that were, in the present and the main playing the part of it or be surrounded by other members that aims to enliven event. Initially Randai media is to convey the story or stories of the people through gurindam or lyric that played, which comes from movements Silat Minangkabau. But in its development Randai adopted figure style and dialogue in the theatricals like groups Dardanela. So, Randai is in the first media to convey the stories of the people, and less appropriate if Randai called Theater Minangkabau tradition, although in its development Randai adopted the style or story telling theater or theatrical dialogue.